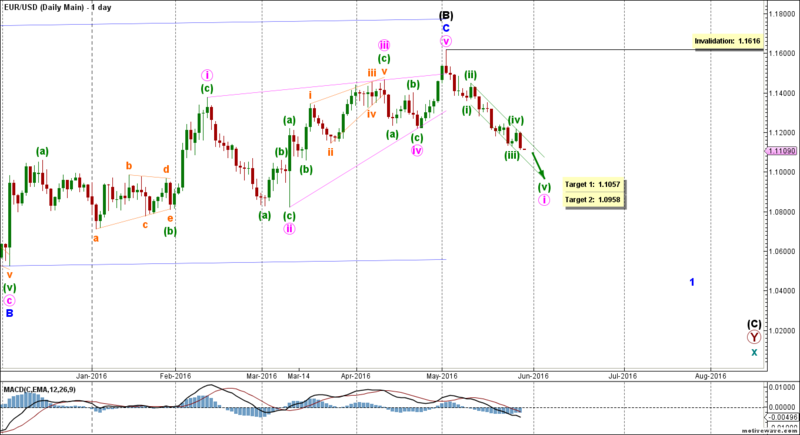 EURUSD: A New Downtrend Begins? In the week since we published our last weekly analysis – in which we expected to see a final rally – the market continued its staircase, slow-but-sure decline. The ending diagonal which looked rather typical a few weeks ago is now coming out of proportion, suggesting that perhaps it had already ended a while back and a new downtrend is slowly, yet confidently, making its way in the market. This most likely completed black wave (B) at 1.1616. Within it, pink wave i is forming an impulse labeled green waves (i) through (v). Within it, green waves (i) through (iv) are most likely complete. 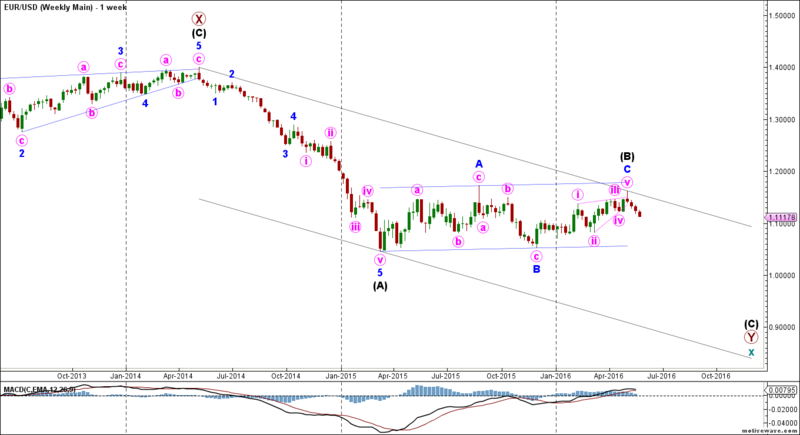 This count expects the euro to move towards the downside in green wave (v) to complete pink wave i. This will be strongly confirmed by movement below 1.1098. Both MACD lines are below the zero line and consistently pointing towards the downside. At 1.1059 green wave (v) would reach 61.8% the length of green wave (i), then at 1.0958 it would reach 100% of its length. This wave count is invalidated by movement above 1.1616 as pink wave ii may not move beyond the start of pink wave i.